Where did gem cutting get its start? Gem cutting, or lapidary, most certainly got its start as an offshoot of mundane everyday activities. A stone may have fallen into a fire where the heat caused it to break or flake. Perhaps a sharp edge resulted. Certainly, flint and other hard stone possess sharp edges, but a blade-like cutting edge on a newly flaked piece of rock suggested some very interesting possibilities. In prehistoric times, man hammered tools from stone, presumably smacking one stone against another. He scratched and chiseled out symbols and primitive writings on hard rock and cave walls – and gradually learned the great secret: some stones are harder than others and therefore they are more capable of inflicting scratches on other less hard stones. From this very basic understanding, drilling and bruting became possible. Drilling, one of the first of the lapidary arts, traces its roots back almost 1,000,000 years ago. Primitive peoples learned that rocks could be broken or fractured. The breakage provided random fragments, but ultimately experimentation demonstrated that breakage could also be achieved with some semblance of control. This same knowledge of relative hardness led to bruting, the shaping of a gem specimen by rubbing one mineral against another harder mineral. The slow and tedious practice of bruting was used for centuries until more refined techniques were introduced. Given the early date, historians are reluctant to attribute anything quite so intellectual as an understanding of cleavages. It was satisfactory that the breaking, chipping, or flaking of a stone could be disciplined…made to occur in desired directions and depth. Later perhaps, someone viewed these same stone fragments from a more abstract perspective. They viewed the unusual configuration, texture, or coloring of a piece of stone or mineral crystal, and began to contemplate the possible alterations of a stone for artistic or adornment purposes. No doubt, too, man compared the smooth, river and stream rolled stones with those found elsewhere. Even here, it required no great stretch of thinking to conclude that something was exerting a smoothing or polishing effect on certain stones. Could it be other mineral particles in the river working to complement the action of the constantly running water? From such questions, the advance to a rubbing paste of water and sand was virtually inevitable. Whether many of these later discoveries broke in the Paleo or Neolithic, (early or late Stone Age,) is of little consequence. What is known is that man used the new found phenomena in anticipation of the many tools and pieces of equipment of succeeding years. By 3,000 B. C., man had developed his lapidary skills to such a level that cylinders made of serpentine, were commonplace. The Scanning Electron Microscope has analyzed many seals of the early Bronze Age that were uncovered in ancient Mesopotamia. Showing remarkable skill and tool control by the gemcutters, these seals were often shaped to form a flat or convex seal face with a raised perforated handle on the back. Highly valued, the seals were worn as amulets that could be removed quickly and pressed into a clay tablet. They were the mark of early man as each seal was an individual creation, made exclusively for its owner. The existence of these ancient artifacts proves how old the art of lapidary is. The artifacts demonstrate that lapidaries had conquered the challenges of sawing, chipping, drilling, polishing and faceting before the time of Christ. The work was rudimentary by todays standards but the principals upon which this work was performed are still with us. The use of jade and jade look-alikes were prevalent. Materials like serpentine only look like jade, but the real value lies in the lapidary skill lavished on the original rough. Centuries before Christ, the Chinese knew how to work the tough green material they called yu and which we call jade. It was also a sacred stone to the Aztecs of North America as well as the Maoris of New Zealand. The tribes of the Swiss Lake District also worked jade. To be sure, pre-Columbian beads of Mexico and South America were crudely worked samples of jade, but some of the more advanced cultures of ancient Mexico worked the material into incredibly intricate and complex carvings. Where available, other forms of jade were also used extensively. These other similar appearing by non-jade types included serpentine, prehnite, and aventurine. Naturally, the various kinds of quartz found quick favor among stone workers. They represented an explosion of varied, rich colors and, although their hardness made them a more difficult to work than the softer stones, many different cultures sought them not for their lush cosmetic values but for mystic purposes as well. The faceted gems of today are incredible optical performers. It has always been that way. For example, the marvelous translucency and transparency of the crystalline quartzes ranged from carnelian, sardonyx, agate, amethyst to rock crystal. The early Chinese, Japanese, Grecian, and Mycenaean peoples found quartz a marvelous mineral for gemcutting, as did the craftsmen of India and Scotland. Amber is undoubtedly one of the earliest stones to be used in jewelry. It is lightweight, easily drilled, and features a pleasing warm color. It was also found floating in numerous parts of the world in fairly large pieces. Such folk work comes from the Orient, Morocco, Afghanistan, and, of course, the Baltic countries. Used mostly in necklaces, many of the beads are large, hand-shaped spheres or ovals. Turquoise has a long history in jewelry. The Egyptians of the earliest dynasties focused great attention on this sky-blue stone, often grinding lit into a powder form to provide a unique blue eye shadowing. It was a highly prized gem of the Mexican cultures, and the Persians and Tibetans used turquoise extensively. Some Germanic people used it as a betrothal stone. Among the American Indians, it was the principal stone. In almost all instances, the workings were those of cabochon cutters, carvers and sculptors who specialized in representational art. A relatively soft stone, turquoise was easily worked and could quickly be buffed to a nice polished finish with a mixture of sand and water. Sometimes it was worked in a nugget form and other times it was shaped. Used alone or in combination with shell, coral and other soft materials, turquoise has continued in great popularity even up to contemporary times. Coral, incidentally, is usually vivid in color and easy to shape so it naturally became famous in Tibet, China, India, northern Africa, and the American Indians. Other stones that found early use among gemcutters were meerschaum, jet and lignite, soapstone, lapis lazuli, and malachite. Where volcanic action was evident, obsidian was also used. It is a medium soft stone, but gemcutters quickly found that quartz pieces and flint could be used to shape it. Obsidian was valued among the Stone Age artisans and then later by Aztecs, Mayans, and Indian tribes of the WesternU. S.
As a matter of fact, in 5,000 B. C. the Zadim, (stone workers,) of Sumeria were even making and working with an early form of glass. Not so surprising is the fact that the initial use of glass was to serve as an imitation gemstone. Later, the Egyptians were to be given false credit for the development of glass or faience, (fah-yahnse’). It is pretty much established now that the real discovery of this glazed terra cotta ceramic ware, with its colored decorations, took place farther East and was brought to Egypt by Sumerian merchants. Even farther east in Cambay, (in Western India’s GujaratState,) bead making has progressed to a fine art. Factories there were producing a variety of beads made from siliceous stones that are even today marketed all over the world. Artisans of the Bronze and Classical Age, especially those who carved Greek seal stones, used techniques that were enormously time consuming. It was their habit to cut small chunks from large local blocks. Obsidian served as the sawing agent, the chunks were shaped with Naxian emery, and then apparently given a final polish with other corundum powders made into a watery paste. Indian literature dated about 2300 B.C. refers to manikyam. Because mani is a term to describe a sphere or bead it appears that some form of gem cutting was practiced that early. Bapu Majajan, a contemporary Indian gemologist and Fellow of the Gemmological Association of Great Britain, feels that these and later references, (about 400 B.C.,) to gemstones in India show that gem cutting, including a rude form of faceting, had its origins in that country. It goes without saying that the more famous transparent gems, ruby, sapphire, spinel, emerald and garnet, appeared in many different forms; all the work of advanced gemcutters. These gems all appear in early jewelry of India, Burma, Sri Lanka, (Ceylon), Persia, (Iran.) They were mostly cut, (or rather polished,) as the natural “Point” shown here. Rubies, because they were treasured above all other gems, have been found mounted in their natural shape while others have been faceted and cut cabochon. It is not well known, but many of the advances in faceting can be attributed to the Islamic Period. In what is now eastern Iran, gemcutters had developed great skills in polyhedral faceting, (11th c. Nishapur,) as well as exporting cutting skills which produced such great traditions as the rock formed crystals of Fatima, Egypt (9-12 c.,) jades and other hard stones of Mughal, India. Keep in mind that a number of technological developments were necessary before a breakthrough in diamond cutting became possible. The diamond’s own incredible hardness and grain directions made it difficult to work with. There existed, too, a decided shortage of cutting equipment save a few hand tools. Lapidaries much preferred the stones softer then diamond, including ruby, sapphire, quartz, and emerald. The practice of cutting gemstones to a specific configuration along with the refinements of development of diamond-cutting techniques, were established in Europe. The techniques of diamond splitting, done to obtain natural octahedral forms of the crystal, was known in Gaul and Germany. By about 1380, a method of true diamond cutting was practiced in France. The diamond point is simply the eight natural facets of the crystal. Diamonds occur naturally in this habit, or a bit of judicious splitting, or cleaving, will easily achieve the same thing. One of the problems with these early diamonds was that the unmodified bottom, (called the pavilion,) was deep. The result was that rings rose too high on the wearer’s fingers. In the latter half of the 16th Century, the only regular forms of cut diamonds were the so-called diamond point and diamond table, both shapes being based on the octahedron. For the most part, these were small stones used as accents to complement large, colored, cabochon-cut stones. The diamond table cut would not have been all that difficult for the ancients to figure out. On an octahedron, the apex represents a four-point cutting orientation so no matter which way the octahedron was pointed, diamond grit would have successfully ground away the tip to a rude table facet. In the earlies stages, the method of grinding was simply to rub one crystal face against the other, a process called bruting. Indeed, many diamond cutters of the time had a small box beneath their manipulations. This was called a bruter’s box and its primary purpose was to catch the rubbings, or diamond dust, given off by the constant rubbing. This dust was then used in the polishing process, its grit being so tiny as to effectively remove the larger scratches. 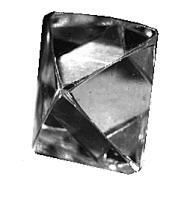 The diamond table was produced by grinding across one of the pyramidal apexes of the octahedron. The facet thus formed was usually about half the width of the central square section. Inspection of old diamond table cuts shows that the cutters brought the table in as square as possible with just a table cut. Occasionally, the sides of the crown were slightly modified to improve the right angles to one another. Often as not, the cutter would also cut a small flat on the bottom, called the culet. Generally, this was intended to avoid accidental chipping or breakage, which might catch a cleavage plane and extend it deeper into the stone. The cleavage plane on a diamond runs parallel to the octahedral faces so a long split up the entire length of the pavilion was not a minor possibility. For that reason, the practice of cutting a tiny flat culet on the pavilion tip is still practiced today. The practice is also followed with colored stones. In the latter case, it is not the cleavage that is potentially troublesome. It is the fragility of a sharp tip on a gemstone that is considerably softer and less accommodating to shock than is diamond. Despite small advancements in cutting styles, the point cut style apparently persisted well into the 17th Century. A number of the world’s museums contain jewelry where the accent diamonds are in the point-cut style. The search for visual performance continued. It appears that most of the new innovations were intended to improve surface performance, the scintillation or twinkle caused by reflections, rather than any knowledge application or pursuit of optical advancement. Doubtlessly, this search led to the development of the single cut. Single cuts are still cut in abundance today and are better known to the public and jewelry trade as chips or Swiss Cuts. The technique consists of dropping in facets at the corner ribs. This nicely rounded off the plan view into something more nearly representing a circle. It was an 8-sided circle to be sure, but a more circular configuration nonetheless. Again, it is not difficult to guess why the single cut represented the next step. The explanation lies in the physical properties of the diamond itself. An easy cutting grain lies diagonal to each rib. If a bruter rubs two diamond ribs diagonal to each other, he is following the soft grain on each crystal. It would not have taken all that much experimentation to determine that four additional corner facets could be dropped in on both the pavilion and the crown portions of the crystal. In contemporary cutting, these corner facets are the same width as the bezel facets and the angles of all eight pavilion facets are 41 degrees. In ancient times, the corner facets were generally narrower than the original sides and no knowledge of appreciation of angles was evident. In the 1400’s, the breakthroughs started in earnest. First in importance was the work of Louis de Berquen, of Bruges, Flanders. Generally acknowledged as the Father of Modern Diamond Cutting, he is best known for his introduction, about 1476, of absolute symmetry, improvements in the polishing process, and the development of the pendeloque shape. He is also credited with the development of the horizontally mounted metal grinding wheel, (known in diamond parlance as a skeif.) It is doubtful if he actually developed the wheel. What he unquestionably did do for the first time, was to cover the metal wheel with diamond dust suspended in oil. The oil, of course, kept the diamond particles on the rotating wheel rather than allow centrifugal force to sling them away. This led to extraordinary advances in polishing technology and control of the cut stones. Because of the great leap in polishing excellence, historians also gave him credit for the wheel itself. This is highly questionable. It is much more likely that this invention occurred in India where diamond working originated. De Berquen certainly made improvements on the wheel. He also used it to far better advantage than heretofore. Indians, though, had been using such flat turning surfaces for centuries. What really made de Berquen’s reputation and his place in history, was his development of the Sancy design. This was a classical pendeloque shape. Entrusted by Charles Le Temeraire, Duke of Burgundy, with three large rough diamonds in 1475, de Berquen responded with a revolutionary level of shape, design, and cutting excellence known as the Sancy design. The impact on the French court on the brilliant, imaginative cuts, was such that all of France and Europe soon began demanding brilliant diamonds. Without a doubt, the age of the diamond had truly arrived. Refinements, as could be expected, were to come along later. It should be recognized that de Berquen, however brilliant his cutting breakthrough, was not concentrating on brilliance and optics at the time. The Sancy design and cuts he originated were intended solely to produce maximum yield in the Duke’s rough consistent with good cutting execution. This design ambition was totally successful. Success though, still wrested payment in kind. The historically famous Sancy Diamond may have represented a true break away from everything that had gone on before, but it is a cut stone that is really too thin to display maximum brilliance as the cut is repeated on both sides. Notice that the corners are merely truncated. They are not the same width as the main or bezel facets. This gives the de Berguen cut a blocky or chunky appearance, a shape known better today as a square emerald. The truly important contribution involved the appearance of triangular break facets on both the crown and pavilion. These helped control and discipline the light. In the absence of theory that would explain what was occurring internally, the break facets improved scintillation by a quantum leap. Little wonder that society responded so favorably to this innovation. Cutting the Sancy on both sides, though, demonstrated that the bottom of a gemstone could provide interesting optical effects. Technically, the Sancy could be called a double rose cut, since the top and bottom are identical. That was interesting enough. Something else, of even greater importance than the bottom reflections, became evident to diamond cutters. With the addition of a second row of facets on each side, it was obvious that external light performance was substantially improved. Far more than any other cuts of the time, the Sancy cuts absolutely sparkled. Thanks to the Sancy influence, the rose cut continued to grow in prominence. Various innovations on the rose cut represented a dramatic departure from previous cutting modes. The Rose cut consisted of a flat-bottomed cut, with a hexagonal, (six fold,) facet arrangements. These facets were stacked symmetrically on the domed and faceted top, or crown. This crown appearance virtually duplicates what today is known as an Apex Cut. The modern Apex cut consists of a rose cut-type crown all right, but it also features a fully faceted pavilion. The apex cut actually developed from lapidaries who had discovered that the way to exhibit a star stone best was to cut a steep top, one that sloped off quickly. This style of phenomenal cabochon cutting dramatized the star’s rays and minimized their tendency to break up. Major change or not, the advantages of the Rose cut included the opportunity to fashion flat stones. It also provided maximum spread and/or yield for a crystal’s weight and size. Throughout the 17th Century, the Rose cut found primary use as ornamentation on costumes, scabbards, sword hilts, harness trappings, epaulettes, dishes, candlesticks, boxes, etc. Some controversy still exists over the origin of the Rose cut. Western history books attribute the cut to the efforts of French Cardinal Jules Mazarin, (1602-61). The ferocious Cardinal contracted for many diamonds in behalf of the French royal court, so many in fact, that an original type of faceting carried his name. Most reliable sources believe that it was developed in Indian and then brought to Europe by Venetian merchants. After all, Indian cutters had produced the famous Koh-i-Nur, (Mountain of Light). This famous diamond was cut in the Rose style no later than 1530 as was the equally famous Great Mogul. The latter explanation appears most valid. Macles and thin fragments were plentiful in India. Indeed, cynical Indian merchants are known to have hoodwinked ignorant miners into believing that the best test of a diamond was to strike it a blow with a hammer. If the crystal did not withstand the hit, it could not possibly be a diamond, the wily merchants explained. Few hard, but brittle diamonds could withstand such a destructive test. When the miner departed after a testing session, the merchants gathered up the broken pieces and fled back to town and the cutting shops. History simply does not record how many fine, large Indian diamonds were destroyed this way. The loss must have been substantial. India was famous as a reservoir of large diamond crystals at the time. It was cut in a variety of forms because the original shape of the rough usually dictated the mode of cutting. The Dutch rose is more pointed than others are. The Antwerp, (also called the Brabant,) is not quite so high with steeper inclined base. With the few exceptions cut in oval or peach shapes, Rose cuts are generally round. The double rose, cut on both sides, achieved some popularity in the 19th Century. For the most part, double rose cutting, and keep in mind that the Sancy and the famous yellow Florentine were both cut in this fashion, gradually transitioned into other formal cut designs. These newer innovations consist of brilloettes, pendeloques, beads, and spheres. Why hasn’t the Rose cut maintained its popularity? Light discipline can be the only answer. When you consider that Rose cuts are designed as a function reflected light the loss potential looms obvious. Some 83% of available light enters a diamond. A diamond reflects only 17% from its surface. The remainder is internal reflection. That means that a Rose cut forfeits more than 4/5’s of its potential brilliancy. The previous discussion represents valuable considerations to take into account as you ponder the decision to cut a transparent stone en cabochon versus faceting it. Not everyone should expect to cut like CSM, Don Clark, as illustrated here. Nor is everyone an accomplished cabochon cutter or carver. Just keep in mind that reflected light enhances surface colors and textures. That is the great strength of cabochons versus faceted stones. The cabochon relies principally on surface reflected light to dramatize the color, texture, pattern, and surface quality of the mineral. The faceted stone utilizes reflection along with deflection. Light not only reflects from the surface but enters the crystal, reflects off the interior of carefully placed and angled facets then emerges again. Often as not, the emergence captures some of the refraction qualities, so the former is separated into its color spectrum too. When light enters a transparent crystal, its rays can be disciplined and controlled. The amount and quality of light returned to the eye demonstrates the ambitions of a faceted stone. Regardless of your experience, you will always cut a lovely gemstone if you keep these simple principles in mind. Earlier mention was made of Cardinal Mazarin. There is considerable controversy over his rightful place in gemcutting history. Yes, the 34-faced, rather chunky, brilliant type of diamond cut is named after him. There is little question, though, that he merely ordered such stones cut and contributed little design or technical influence other than financing. Mazarin became a Cardinal of the Church in 1640 and succeeded Richeleau in 1642 as First Minister of France. A gem fancier par excellence, he continued in that office until his death. Throughout his life, he remained one of Tavernier’s best customers. That really seems to be his chief claim to lapidary fame. With a constant supply of fine, large rough specimens, he commissioned many rose cuts. He commissioned so many in fact that some improperly have attributed the development of the rose cut to him. The rose cut actually was in vogue years before his time. Upon his death, Mazarin left a will that bequeathed eighteen diamonds. The will conditionally included de Berguen’s Sancy, as well as the Mirror of Portugal, to the French crown. His condition was that they were to be known as The Mazarin Diamonds. Not surprisingly Mazarin is thus sometimes credited with cutting the Sancy. Mazarin is also incorrectly credited with the breakthrough developed in the brilliant cutting mode. This cutting style featured a cushion shaped cut with 17 facets above the girdle and 17 facets below the girdle. de Berguen had actually performed this design more than 100 years earlier. It should be apparent that lapidary history could not show any one single inventor of the round brilliant cut. Each advance depended on better technology and then the creativity of cutters. They coupled what knowledge they possessed of diamonds and colored stones to make use of the improvement in tools, materials, or technique. A major step, though, took place late in the 1600’s in Venice. There a diamond cutter apparently named Peruzzi modified the Berguen double row style. Peruzzi’s new 58-facet cut introduced the concept of break and star facets. This innovation was in effect a triple cut. Although the design was to undergo a number of variations, the configuration is essentially what is seen today in the round brilliant cut. The first name, Vincenzio, is often given for Peruzzi but intensive research shows that, while Venice did have a Peruzzi family at the time, there was never anyone named Vincenzio. Remember: even the Peruzzi cut was blocky, not a perfect round. Also, even at this late date, rough diamonds and colored stones were still usually rounded by the tremendously laborious technique of hand bruting. This was especially true when the diamond occurred in the octahedral form. With the discovery of the Brazilian diamond deposits, a great impetus was given to brilliant cutting. The new designs were in a cushion shaped form known as old-mine cuts or Brazilian cut. Still, the cutters remained faithful to the triple cut mode. With 58 facets, such a cutting design represented the forerunner to the Old European, (essentially an Old Miner design, but rounded verses the Miner’s squarish appearance,) and the modern round brilliant. Smaller stones were single cut with 17 facets on the crown and 16, (not including a culet facet,) on the pavilion. Despite advances, the original shape of the crystal still dictated the plan shape of the finished stone. When working with octahedrons, the cut would invariably come out squarish, or cushion shaped. If the shape was more of a rhombic dodecahedral then, a round shape could be expected. In the 19th Century, more fully rounded diamonds were being produced. These gradually became known as Old European Cuts. Compared to modern cutting practices, they were characterized by small tables, large culets, and greater depth. In addition, English cutters opted for thinner girdles than Dutch cutters. For years, it was this difference that marked a stone’s cutting origin. Thus, when viewing an Old European cut, inspect the girdle: its thickness often reflects English or Dutch cutting. When the Polish engineer, Marcel Tolkowsky, in 1914 published a theoretical treatise on the ideal dimensions of the diamond, the modern round brilliant form finally came into its own. Marcel’s document established the accepted cutting angles for pavilions, (41 degrees,) and crowns, (34 degrees.) Interestingly enough, Tolkowsky never provided one iota of mathematical or optical proof that his angles represented the ideal. Some critics have suggested that his diamond cutting production experience could have led him to select angles that would produce a pleasing silhouette while maximizing yield from the existing angles of rough octahedral crystals. In any event, publication and acceptance of Tolkowsky’s calculations pretty much ended the experimentation that various cutters had been making over the years in their search for greater brilliance. Tolkowsky’s dimensions may have earned a warm reception from cutters but the optical performance of the result has never been questioned. His dimensions called for greater precision and discipline. This led to the development of better machinery and tools. It likewise placed more emphasis on machine bruting and sawing. Of considerable impact to the cutting trade, the ideal diamond configuration was an almost immediate hit among diamond buyers. Small diamonds were still cut primarily for yield, but on larger and better quality gems the proportions became a virtual must as buyers literally measured the new dimensions. Modifications to Tolkowsky’s original computations were inevitable. The table became slightly larger and the pavilion girdle, or break facets became longer, sometimes extended to 8/10ths of the distance from girdle to culet tip. Increasingly, recutters began adding faceted girdles, especially after the original patents ran out. Because colored stone fashioning is a derivative of diamond cutting, the new theories and shapes quickly spread throughout the lapidary industry. Lapidaries continued to experiment and it was not long before they realized that the chemical, optical, and physical personalities of the various stones varied considerably. It was seen that cutting angles needed modification for each variety of gemstone. Unfortunately, there is little scientific justification for many of the published angles on colored stones. Today, many of these so-called recommended angles appear more a figment of the authors’ imagination and personal bias than they do as mathematically based criteria. As more research emerges concerning the influence of refractive index and critical angle, it appears that the variations in recommended angles have little basis in fact. The problem with angles is also compounded when the true basis for cutting is considered. The diamond is primarily cut for brilliance or the return of white light. Even with brilliant colored diamonds, called fancies, the cutting remains directed toward brilliance. Not so with colored stones. With the exception of clear or river colors where brilliant cutting is the objective, most colored stones are cut just for that, color enhancement or promotion. A beautiful raspberry hued garnet, or rich green emerald, is cut so as to dramatize the color. Under these circumstances, brilliance becomes a subordinate goal. 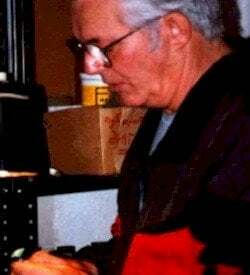 Based on math and raytrace analysis, the author, Gerald Wykoff CMG GG showed mathematically that almost any transparent crystal could be effectively cut with angles of 42-degree main pavilion and 36-degree main crown. He further demonstrated the validity of these angles by analyzing the mathematics of the rainbow and its display of colors to the viewer from the 42-degree anti-solar position. This colored stone angle set, he claims, represents the best, and most natural, compromise between color and brilliance. Most diamond cutting consists of cutting the round brilliant or one of its variations. The latter includes such cuts as the pear, marquise, oval, heart, etc. It has been estimated that some 90% to 95% of all diamonds are cut in the round brilliant style or one of its variations. Lapidaries, understandably enough, facet commercially in the round brilliant mode at only slightly less than the diamond ratio. Emerald, or square shaped diamonds, cut in the step or trap style, developed later. Once cutters realized how these cuts dramatized and improved color, the incidence of step cutting steadily increased. Accordingly, cutters developed greater appreciation and skill in showcasing color. It required more advanced equipment, too, to cut the long, strictly disciplined facets so necessary in step cutting. Responding to the appreciation of the long, classical proportions of the emerald cut, colored stone cutters’ experimentations in the last few decades have produced a series of magnificent innovations. These new designs mix brilliant and color cutting techniques. Some innovations, which create a sort of brilliant color spray or light fountain effect, go by such design name of Radiant, Trilliant, Barion, and Princess. For the most part, these mixed designs combine step cutting with brilliant cutting. Simultaneously, conventional step or trap cutting showed a steady progression too. Square or rectangular facets versus the kite or triangular facets of the brilliant style, of course, mark step cutting. The old table cut, for example, is more closely related to a step cut than to a brilliant and this becomes ever more evident as the square extends into a rectangular shape. For diamonds, a step cut is almost invariably determined by the shape and grain of the rough. Yield is greater when cutting a non-standard configuration cutting straight lines that match the rough’s outline. Yield understandably suffers when a rounded brilliant cut is imposed on rough. Furthermore, step cuts do not always require symmetry. There is another important benefit in step cutting. These cuts are deliberately deeper or thicker than brilliant cuts. It is this extra depth that provides the much better showcase for colored gems. The laws of physics state that, the longer light travels through a medium and is subjected to selective absorption, the richer and purer will be the visible hue. Thus, the step cut, which most dramatically showcased in the great green emerald, finds great validity among colored stones. Because the trap cut is significantly deeper than a brilliant cut, the resultant reduction in the amount of brilliant white light actually enhances the color content. It is no accident that most emeralds are cut in the step or trap mode. 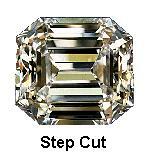 This well-known preference has earned the cut the label – emerald cut. Only in the last few years has modern diamond cutting penetrated India. The hand held techniques of Indian cutters, together with a manually driven iron-cutting wheel, have been practiced for centuries. As a matter of fact, the famed international traveler and writer on gem lore, Jean Baptiste Tavernier, visited the diamond cutting shops of India in 1665. Even then, he observed that the skills of the many cutters apparently had not progressed much beyond their primitive beginnings. It was standard practice to rub the diamond by hand over a diamond dust covered metal plate. Later, they fabricated a rotating wheel that could be turned by hand driven cranks. As for technique, when an Indian cutter detected a blemish or inclusion he would continue to orient the stone until reaching a soft grain direction. Then he would simply grind in a facet, removing the defect. You could spot an Indian cut stone and evaluate its clarity with some accuracy. A poor quality stone was covered with haphazard facets. Furthermore, the imperfection removing facets offered no consideration to symmetry. Probably the most acceptable distinction between Indian and European diamond cutting as this: discipline. The Indian cutter’s primary objective was to polish the existing faces of a crystal. If necessary, he would cover the crystal with an abundance of facets intended to remove unsightly flaws. However, he gave no attention toward shape, symmetry, or beauty of form. The European cutters, and they are generally credited with making diamond cutting an art form, strived for pleasing shape and improved light performance. This same striving later led to the investigation of optical possibilities. The cutters’ intent was actually to improve upon the potential of a diamond’s physical, chemical, and optical properties. In short, diamond polishing may have been the contribution of the Indian artisans. 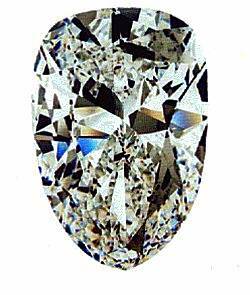 The European, particularly the Italians and the French, provided the craft of diamond cutting. Tavernier, who was thoroughly familiar with the diamond cutting industry in France and in Italy, could make such a rapid assessment. He was thoroughly familiar with the spreading use of iron diamond cutting wheels and specialized tools utilized in European shops. He was also familiar with the growing body of optical knowledge. Knowing that Europeans were thrusting ahead with one superb diamond development after another, he realized that colored stone progress, enjoying a sort of trickle down, was advancing in step. Intarsia, also known as pietre dure or mosaics, in hard stone, reached its highest level in Italy. Individual masterpieces have been traced back to the early 17th Century. For nearly 400 years the famed Opificio delle Pietre Dure, (workshop of hard stones,) in Florence has remained world famous for the exquisite marvels that flow steadily from its workbenches. Today, the work in the Opificio is mainly restoration and contract stained glass work. Some original work is done but it is on a much smaller scale. In its heyday of incredible stone paintings, only royalty could afford such masterpieces. What gave the Opificio its advantage was the nearby availability of pietra paesina i.e., landscape stone. The Alberese stone together with, Arnolineato, an agate from the Arno river valley near Florence, assured the pre-eminence of Florentine intarsia. Only the Owyhee and BiggsCanyon jaspers of America’s Northwest can rival this marvelous dark stones. The Alberese stone is a limestone patterned in grays and browns, suggesting silhouettes. Arnolineato is striped in grays. Boulders of the stone are first slabbed and polished. Into this stone are fitted or inlaid the contrasting stone. This forms the incredible stone paintings and art renderings that made Florence the center of intarsia. Even by today’s standards, the Florentine techniques are astonishing. In the main workroom, the large grinding machines are located in the center of the room, looking like old fashioned roll top desks without the top. Each craftsman, perched on a high stool at the work station, operates a hand tool which is driven by a foot pedal arrangement. The pedal looks like an old foot driven sewing machine. They are attached to a horizontal spindle with a tiny abrasive wheel. With his work on the table top in front of him, a craftsman skillfully shapes slabs and pieces of the pattern into precise fitting parts. In earlier years, before the advent of electrically driven equipment, stones were cut by a wire mud saw setup. Pieces were sawed from the slabs with a bow type wire saw using a steady stream of grit and water. Once the individual pieces had been cut to precise dimensions, they were lapped to equal depth on the big machines. In the final stages, the pieces were, and still are, attached with mastic to a base of slate. As splendid as were the faceting and inlay advancements, traditional cabochon cutting kept pace. For too long, a cabochon consisted merely of a rounded egg shape. Resisting iron bound history, gem cutting artists began experimenting, creating new forms and shapes, and taking an occasional venture into light control. Michael Dyber, a winner of numerous international awards, represents a good example of the new, creative cutting edge. In the last few years, cabs have vaulted into public attention as cabbers developed forms in their own right and also blended their innovations with classical faceting. Likely as not, the marriage could produce a Dyber creation or something more in the carving mode from Larry Woods, marvelous geometric forms that control and direct light.